Indywood is an initiative to elevate India as the global hub of the film industry. The core of this $10 billion visionary project comprises of a Consortium of Investors. The investors who are part of the consortium bring with them not just funds, but also the know-how and connections to initiate comprehensive and innovative changes in the production, screening and marketing strategies as well as the business model of Indian Cinema. Despite being the largest film producing nation in the world, India lags behind other nations in terms of distribution reach and exhibition rights, ranking far behind in the list of revenue generated by global film industries. The lag is mainly due to the fragmentation of the industry on the basis of language and geographical barriers within the country. With 100 set targets, the investment into the Indian entertainment industry as part of Project Indywood, will be deployed for setting up global distribution partners, 10,000 new 4K projection multiplex screens, 100,000 2K projection home cinemas, film studios, animation/ VFX studios and film schools conforming to international standards among other deliverables. 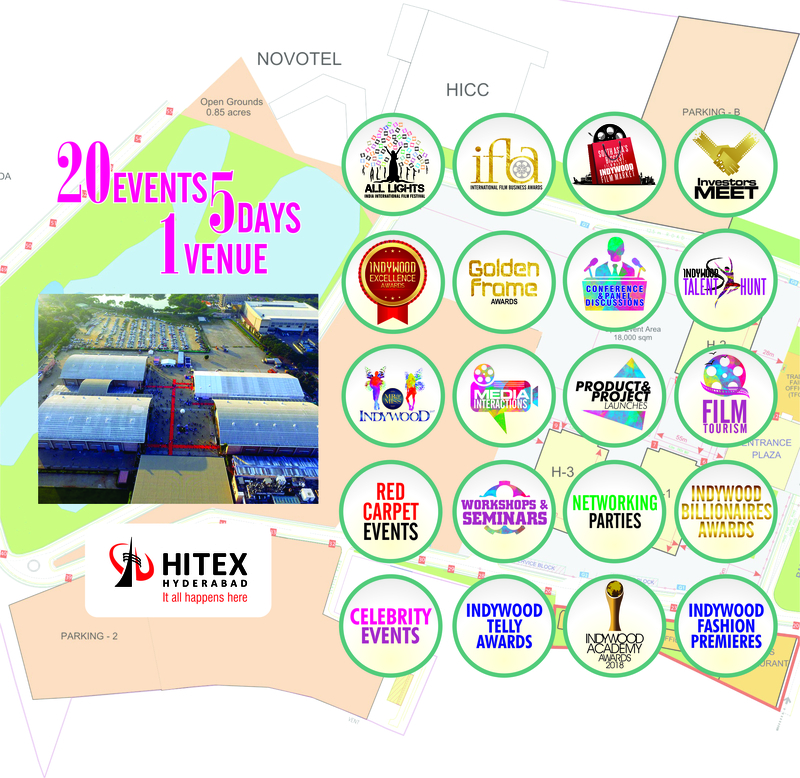 The Indywood Film Carnival acts as a platform for the consortium to network and partner with prospective business channels and film makers, through interactive meetings, panel discussions and conferences. In line with Indywood’s vision to honour the best of cinema irrespective of language or nationality, Golden Frame Awards are presented to the best films screened at the All Lights India International Film Festival (ALIIFF). The event also recognizes the creative excellence in cinema by honouring legends of the industry for their contribution to the movie fraternity. Indywood Film Carnival aims to provide a launch pad for exciting new projects and products from the film industry. The Project launch feature is ideal for film makers looking to grab attention for their work. Technologists, start-ups and innovators can use this platform to promote their products and reach out efficiently to their intended audience segment. Those looking for special launch programmes should intimate the organizers of their requirements well in advance. The Film Business Quiz is a novel and fun filled event for pundits of the film industry to rack their brains and test their knowledge of Indian and world cinema. To be conducted by a renowned quiz master, the event is open to all and is considered a unique concept among the close-knit quizzing fraternity. Indywood Interactions is the perfect platform for prominent film industry professionals to discuss about the business side of films and interact with stakeholders from the global film industry. The event includes an array of sessions including panel discussions, conferences and seminars by industry specialists. There will also be Master classes led by the best from the industry. These sessions aim to provide the visitors an understanding and insight into the industry, as well as generate ideas about negotiating with prospective investors. Workshops & Seminars are an integral part of the carnival and provide hands-on experience to budding talents to hone their skills and learn more about the different aspects of filmmaking. The different sessions will be handled by industry experts at the top of their game, and is one of the biggest crowd-pullers of the carnival. Slots for each session are limited and provided on first-come first-serve basis. This is an exclusive platform for national and international media professionals to meet and interact with celebrities, film directors, industry professionals, budding artists, VIP delegates etc at the film carnival, and bring public attention to their projects and social causes. There will be designated media rooms, as well as open spaces for the participants to interact with the media. Indywood Excellence Awards(Marine/Offshore/Oil & Gas) – Awarded to entrepreneurs, visionaries and organisations for their commitment, vision and dedication in taking a new approach and creating a culture of innovation in the maritime industry. Indywood Media Excellence Awards – Awarded to print and online media practitioners who have demonstrated excellence in providing ethical media solutions, products and services to the entertainment industry. Indywood CSR Awards – – Awarded to an organisation / an individual for their responsible and sustainable CSR practices that have set a standard for others to emulate. Indywood Medical Excellence Awards - Awarded to medical personalities whose efforts have contributed towards improving the quality of healthcare facilities. Indywood Educational Excellence Awards - Awarded to schools, educators and administrators who have imparted quality education under multiple categories. Indywood IT Excellence Awards - Awarded to IT based organizations and individual contributions for their remarkable contributions to the software industry. Indywood Hospitality Excellence Awards - Awarded to hotel owners and operators who have provided exceptional services. Indywood Built In India Excellence Awards - Awarded to individuals and organizations who have made exemplary efforts towards innovating by building and designing products in India. Film Tourism offers unique and exclusive tourism packages for film enthusiasts from across the globe to go through the inspiring history of 100 years of Indian cinema. Itineraries include visits to studios, archives, museums, exhibitions, locations and film cities of historical and cultural importance. Add-on packages taking tourists to various exotic locations like the Taj Mahal, the golden beaches of Goa, and the dream back waters of Kerala, are also offered to the discerning traveler. Mr. & Miss Indywood is a prestigious platform to search for a male and female face that embody oomph, style and confidence and can steal the hearts of millions through their underlining beauty and captivating personality. The beauty pageant will also be hosting an exclusive exhibition of costumes and wardrobes by International fashion designer Shravan Kumar. Red Carpet Events & Networking Parties at Indywood Film Carnival allow delegates to gain access to the elite class of the film industry. These events are ideal for networking and act as an informal forum to meet regional, national and international entrepreneurs, renew old connections and develop new bonds with the who's who of the industry. Exciting activities and programs are conducted at these parties to make the event entertaining for all guests.